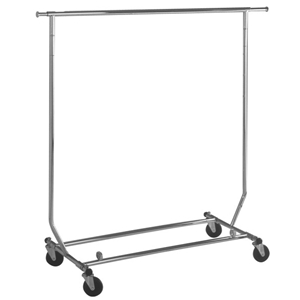 Our most popular all chrome Collapsible Rolling Rack features a 1" round tubing frame, 48" hangrail, adjustable height, (2) 12" pull-outs at ends of hangrail, (4) 4" ball bearing casters and easily folds for storage or travel. The collapsible rolling rack is the perfect solution for moving inventory from stockroom to sales floor, overstock storage, traveling, displaying seasonal and sale items, and home storage use. • Adjustable height 57" to 67"